Falkirk midfielder Will Vaulks has completed his move to English Championship side Rotherham United. The club has confirmed that it reluctantly accepted a bid late on Thursday night for the 22-year-old Englishman whose future had been the subject of frenzied speculation over the past week. Vaulks travelled south and underwent a medical on Friday afternoon before signing for the Yorkshire club managed by former Hibernian boss Alan Stubbs. Although Falkirk have not revealed the size of the fee involved it’s thought to be in the region of £300,000. A club statement said the Rotherham offer had been accepted “with great reluctance” and added: “Having held lengthy negotiations with more than one English Championship team the two clubs have now come to an agreement which has been deemed acceptable by the Board of Directors of Falkirk FC. “Will was into his final year at Falkirk FC and with the possibility of losing the midfielder’s services for nothing in December, the substantial offer put forward by Rotherham United FC late last night was one that was is in both the interests of the player and club to be accepted. “There is no underestimating that losing Will is a massive blow to the club both on and off the field. “Having arrived at the Falkirk Stadium in February 2012, Will went on to make 142 appearances, during which time he scored a total of 13 rather memorable goals. “He is a player with great versatility and over the years has endeared himself to the Falkirk support with his trademark cartwheel celebration and all round genuine nature, it’s never a hassle for Will to attend events in the local community or stop for a picture with fans both young and old. 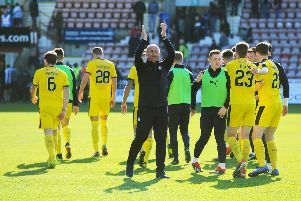 “Chairman, Doug Henderson and all at Falkirk FC would like to place on record their extreme gratitude to Will for his magnificent service to the club both on and off the park. Vaulks’s final appearance in Falkirk colours came on Tuesday when he netted the opening goal in a 3-0 Betfred Cup win over Elgin City. Rotherham boss Stubbs said of his new signing: “He’s someone I came across in Scotland, obviously from my time at Hibs. “He’s a young player and he’s combative. He has improved over the last couple of seasons since I’ve been in Scotland and he’ll give us a little bit of steel as he’s good at winning the ball back.